Sadly, the non-hidden cocaine gave the game away. Carols Valenuela and his friend Charlie - who weighs exactly 1.8kg and is enormously popular at parties - were taking a drive through Texas, when they were pulled over after Carlos failed to signal a turn at an intersection. The cop from the El Paso County Sheriff's Office who pulled them over noticed that 42-year-old, Carlos, was rather nervous, and that he kept casting surreptitious glances towards the bag on the seat next to him. The bag, of course, contained vast quantities of cocaine. 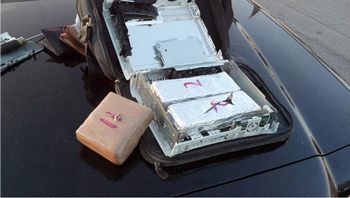 Now, Carlos had quite cleverly hidden two bricks of cocaine inside the gutted remains of a classic Xbox 360. Unfortunately, he'd chosen a slightly less convincing disguise for the remaining brick - namely a " brick-like bundle wrapped in brown tape." Naturally the sniffer dogs were called in, and shortly thereafter the Xbox was prised open, revealing the drugs within. Valenzuela now faces a charge of manufacture or delivery of a controlled substance. Assuming this is the first time he's been caught and he wasn't arrested within 1,000 feet of a school or youth center, he's facing anywhere between 15 to 99 years in state prison and a fine of "not more than $250,000." He's been placed on a $25,000 bond.